A huge highlight of my journey through Northern India was that it coincided with the Hindu wedding calendar. While I have always been aware of the grand celebrations that take place on the day of the ceremony, during my travels I learnt that the numerous events leading up to the marriage are just as sacred and are even thought to play an important role in the relationships’ success. Before the wedding, it’s customary to celebrate the “Pithi” ceremony, which is expected to bring good luck for the soon to be married couple. “Pithi” is a paste made of turmeric, chickpea flour and rose water. The bride and groom have separate celebrations, along with their respective families, where the paste is applied to their skins. Another ritual, which I was lucky enough to witness, is called the “Mehndi” event; a colourful celebration held the night before the marriage ceremony and traditionally celebrated by the women on the bride’s side of the family. Guests dress in colourful clothes, sing traditional songs and dance to popular music, while henna is intricately applied on the hands, arms and feet of the bride and her female relatives by a professional ‘mehndi’ artist. The wedding day starts with the arrival of the groom. The “Baraat” is the festive procession the groom takes to the wedding venue. While male family members and friends dance and sing around him, the groom makes his way to the ceremony on a white Marwari horse colourfully decorated with garments and textiles. Upon the groom’s arrival, he is greeted by the bride’s mother and led to the altar, where there is a prayer to Lord Ganesh. This is one of the most worshipped deities in Hinduism, and is revered as the remover of obstacles. At the bride’s arrival, she is escorted by relatives to the altar, where she exchanges garlands with her husband-to-be before her father gives her away. The priest then lights a sacred fire, or Agni, representative of the gods’ presence, which the couple walks around seven times - or in some cultures, just four - whilst keeping in mind the four aspirations in life: Dharma, Artha, Karma and Moksha. As they finalize the rounds, there is a race to sit down. It is said that whoever sits down first will “wear the trousers” in the house. Afterwards, the couple takes seven steps together, each representing one of seven vows. The groom then gifts the bride with a string of black and gold beads around her neck and places “sindoor” – a red vermilion powder dot – on her forehead, symbolizing her status as a married woman and the grooms’ devotion to her. 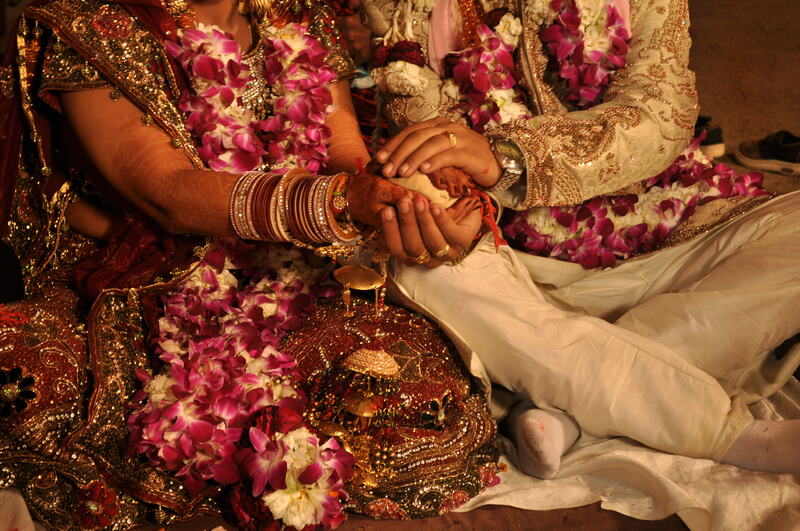 Rings are also exchanged, whilst the newlyweds feed each other sweets. Finally, the couple is blessed by the priest and their relatives; followed by a shower of flowers and rice by the guests, wishing them a long and happy marriage. For those lucky enough to witness this beautiful ceremony first-hand, the memories will stay with you for a lifetime. Get in touch to begin your very own journey through India.